We’d love your help. Let us know what’s wrong with this preview of The Edge of Dreams by Rhys Bowen. Molly Murphy Sullivan’s husband Daniel, a captain in the New York City police force, is stumped. He’s chasing a murderer whose victims have nothing in common—nothing except for the taunting notes that are delivered to Daniel after each murder. And when Daniel receives a note immediately after Molly and her young son Liam are in a terrible subway crash, Daniel and Molly bot Molly Murphy Sullivan’s husband Daniel, a captain in the New York City police force, is stumped. He’s chasing a murderer whose victims have nothing in common—nothing except for the taunting notes that are delivered to Daniel after each murder. And when Daniel receives a note immediately after Molly and her young son Liam are in a terrible subway crash, Daniel and Molly both begin to fear that maybe Molly herself was the target. Molly’s detective instincts are humming, but finding the time to dig deeper into this case is a challenge. She’s healing from injuries sustained in the train crash and she’s refurbishing her house, which has only just been rebuilt after burning down. She’s also sidetracked by her friends Sid and Gus’s most recent hobby, dream analysis. And when Molly herself starts suffering from strange dreams, she wonders if they just might hold the key to solving Daniel’s murder case. To ask other readers questions about The Edge of Dreams, please sign up. Did anyone else notice that Daniel seems to be a bit "dumbed" down in this one? He has always been portrayed as a typical turn of the century chauvinist (which is appropriate for the setting. Molly is the more out of step for the times character) but I never noticed him being so obtuse before. One of my favorites in this great series! The Edge of Dreams kept me on the edge of my seat in constant anticipation. I spent the whole book looking over my shoulder for the next danger or villainous act. How great is that! Rhys Bowen has given us a story that does exactly what a mystery/suspense book is supposed to do, keep us on that edge where we are afraid of what might happen next, but we must know. Every time I read a Molly Murphy mystery, I wonder just how Rhys can make each book so fresh, so titillating, so un-put-downable. She The Edge of Dreams kept me on the edge of my seat in constant anticipation. I spent the whole book looking over my shoulder for the next danger or villainous act. How great is that! Rhys Bowen has given us a story that does exactly what a mystery/suspense book is supposed to do, keep us on that edge where we are afraid of what might happen next, but we must know. Every time I read a Molly Murphy mystery, I wonder just how Rhys can make each book so fresh, so titillating, so un-put-downable. She is simply and deeply one of the best at her craft. The characters, the plot, the setting, the themes draw the reader into the world of the early 1900s, 1905 in this particular tale, and absolutely captivate from beginning to end. After finishing this book, you will have to re-acclimate to the present day, and you will do so reluctantly. In Molly's latest adventure or as is often the case, misadventure, she is only a few months back from Paris and her amazing murder solving there. She and husband Daniel, a New York City police captain, are moving back into their home on Patchin Place in Greenwich Village. It has been mostly restored from the fire that devastated it and Molly's family before her Paris trip. Molly is thrilled to be back on Patchin Place, across from her dear friends Gus and Sid, even if it means that Molly's mother-in-law will be staying for a bit. A most welcome surprise is the arrival of Bridie, the young girl who accompanied Molly to America from Ireland, with Daniel's mother. The extra help is needed, as Molly and her one-year-old son Liam have just survived a train crash, which has left Molly with cracked ribs and a substantial bump on the head. Liam is unscathed from the ordeal, and his rambunctious activity is much more manageable with Bridie around. Daniel, who is working on what appears to be a serial murder case, is grateful to have Molly and Liam in good hands while Molly recuperates. Sid and Gus, as usual, are involved in a new interest that becomes crucial to both Daniel's case and Molly's survival. Dream analysis is a new area of study, and Gus has recently studied it some with Dr. Sigmund Freud in Europe. Gus is eager to pursue this interest in America, but America is somewhat behind in the studies of the mind. Molly, having grown up with the Irish tales of dream significance and the sixth sense, is open to this new line of inquiry into the human psyche, and she develops a personal interest when a recurring dream leaves her worried. Before long, there is the inevitable collision of Molly's world and Daniel's case. Daniel has come to appreciate Molly's detective skills, even if he doesn't want her to resume her detective career. The murderer whom Daniel seeks is a new kind of monster, killing in what seems a randomness and senselessness among the average, unassuming population of a simple-minded woman, a judge's wife, and a tutor's mother. But, as Molly and Daniel have too often discovered, there are few coincidences where murder is concerned and links don't always pop out to announce themselves. Dream analysis, hard digging into connections, and dangerous surprises will carry Molly and the reader from random to related with a flow of non-stop action and unrelenting pursuit. 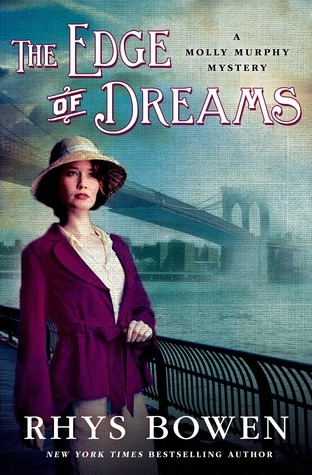 When The Edge of Dreams came up for review, I knew I would be starting the Molly Murphy series in the middle. But I thought I would give it a try anyway since I’m in love with the cover and have been craving a good mystery. The author does a fantastic job orientating the reader within the story. I didn’t feel lost in the series what-so-ever. There was clearly a back story and events in previous books obviously shaped this book but you don’t have to read the others first in order to read this book When The Edge of Dreams came up for review, I knew I would be starting the Molly Murphy series in the middle. But I thought I would give it a try anyway since I’m in love with the cover and have been craving a good mystery. The author does a fantastic job orientating the reader within the story. I didn’t feel lost in the series what-so-ever. There was clearly a back story and events in previous books obviously shaped this book but you don’t have to read the others first in order to read this book, which I loved. The author starts right in with the action and mystery and every event that happens after propels the story forward. I don’t know if ‘fast paced’ really describes this accurately….I would say it was more of a progressive mystery. It was steady and held my interest. I was intrigued by the mystery itself and enjoyed watching the clues come together. I loved how Molly’s mind worked out the clues. She had a knack for seeing the logic in the clues but not in an know it all kind of way. It was more that she was looking at things with a fresh pair of eyes and pointing out what was missing. I loved that about her character. Well first of all, I love that this novel was set in New York. While I hold England near and dear to my heart, I think that it’s nice to have a change of venue in this case. Second, Molly is spunky but not in a know it all kind of way. She isn’t so overly head strong that it’s annoying. She is practical and though she has a fiery spirit, it doesn’t dominate her. She’s a wife and a mother but still trying to maintain her independence as a detective which I liked. She seemed real….trying to balance all these different roles can be a challenge but Molly meets them head on. I’ve been a fan of Rhys Bowen since I first stumbled across one of her Constable Evans books in a library about 15 years ago. So it’s a mystery to me why I’ve never read any of her Molly Murphy books – especially since I love historical mysteries and the Victorian/Edwardian era as well. Luckily for me, I was given the chance to read the most recent book in the series, The Edge of Dreams, for a tour. Now I’m well and truly hooked. To begin with, I really like Molly. She’s an independent and strong I’ve been a fan of Rhys Bowen since I first stumbled across one of her Constable Evans books in a library about 15 years ago. So it’s a mystery to me why I’ve never read any of her Molly Murphy books – especially since I love historical mysteries and the Victorian/Edwardian era as well. Luckily for me, I was given the chance to read the most recent book in the series, The Edge of Dreams, for a tour. Now I’m well and truly hooked. To begin with, I really like Molly. She’s an independent and strong-willed young woman, adjusting with some difficulty to the social confines of married life. Although she has given up her career as a private detective, old habits die hard, and her husband’s job as a police detective keeps her in touch and involved – not always iwth Daniel’s approval. Molly has a touch of the Sight, too, but it doesn’t play a big role in her mystery solving, at least in this book. I like Daniel, too; he’s not terribly happy about Molly pursuing her inquiries, especially if it’s dangerous or involves his case(s), but he loves her and he’s honest enough to respect her abilities. Their marriage, like society at large, is finding its way between the expectations of the past century (the book takes place in 1905) and the changes of the present – including women’s growing push for independence and equal rights. There are several well-drawn supporting character, ranging from Molly’s friends and neighbors, the unconventional Sid and Gus, to her young son and mother-in-law. It’s an engaging milieu, with realistic affection and tension between Molly’s mother-in-law and Molly. Even suspects and minor characters ring true; no one feels flat or caricatured. The mystery itself is well-plotted and satisfyingly difficult to solve: a string of seemingly motiveless and unrelated deaths, tied together only by the notes the murderer sends to Daniel. It was ages before I began to have even a glimmer of who the culprit might be. This isn’t one of those books where you know all the suspects up front (or nearly so); it’s more like a real investigation, in which the clues are slowly uncovered through persistence and, sometimes, luck. Bowen also weaves in the new science of psychology (alienism), particularly dream analysis, and the dreams of both Molly and a young girl, adding both atmosphere and perhaps clues to the mystery. The overall tone of the Molly Murphy novels is more series than Georgie’s delightfully madcap adventures in Bowen’s other series, Her Royal Spyness. That’s not to say there aren’t moments of humor in the Molly books, but if you prefer your mysteries to be on the realistic side, this series definitely delivers. Personally, I enjoy both, so I will happily continue reading the Royal Spyness books while I catch up on the Molly Murphy series! #14 in the Molly Murphy series. It's September 1905 in NYC and Molly prepares to return to her home, rebuilt after being firebombed (City of Darkness and Light (2014)). Taking the Ninth Ave. El downtown from the interim apartment she has been sharing with husband, NYPD Capt. Daniel Sullivan, Molly and her year old son are victims of a terrible crash when the train is switched to the Sixth Ave. tracks and going too fast for conditions is derailed. Daniel's mother and ward, Bridie, come to care fo #14 in the Molly Murphy series. It's September 1905 in NYC and Molly prepares to return to her home, rebuilt after being firebombed (City of Darkness and Light (2014)). Taking the Ninth Ave. El downtown from the interim apartment she has been sharing with husband, NYPD Capt. Daniel Sullivan, Molly and her year old son are victims of a terrible crash when the train is switched to the Sixth Ave. tracks and going too fast for conditions is derailed. Daniel's mother and ward, Bridie, come to care for her and her son as she recovers from cracked ribs and a concussion. Her relationship with her mother-in-law is improving as each grows to appreciate the merits of the other and Daniel grows to understand that Molly's detecting instincts won't be denied and he makes use of her insights. It's 1905, and Molly has ostensibly retired from private-detective work since marrying NYPD Capt. Daniel Sullivan, but she can't help using her intuition and intelligence to solve crimes, even after motherhood. Daniel is under pressure to solve a series of murders that appear to be connected only through taunting notes that are addressed to him at Mulberry Street police headquarters. When Molly and their nearly year-old son, Liam, survive an elevated-railway accident in which others perish, Daniel fears that the killer engineered the derailment to target his wife and child. Despite being seriously injured, Molly presses ahead with aiding her husband in his investigation. My favorite Molly Murphy to date. Wow what a twisted web of revenge, trauma, trying to use the new dream interpretation methods used by Freud. Very good. Can't wait to read Away in a Manger! Another thoroughly enjoyable Molly Murphy mystery. The Edge of Dreams by Rhys Bowen is a very intriguing mystery. Set in the early 1900s, it is a historically accurate and compelling novel starring the very charming and intrepid Molly Murphy Sullivan. Although it is part of Molly Murphy Mysteries series, it can easily be read as a standalone story. Molly Sullivan's husband Daniel is investigating a perplexing string of murders when she and her young son are involved in a train accident. A note sent by the killer takes claim for the crash and Dani The Edge of Dreams by Rhys Bowen is a very intriguing mystery. Set in the early 1900s, it is a historically accurate and compelling novel starring the very charming and intrepid Molly Murphy Sullivan. Although it is part of Molly Murphy Mysteries series, it can easily be read as a standalone story. Molly Sullivan's husband Daniel is investigating a perplexing string of murders when she and her young son are involved in a train accident. A note sent by the killer takes claim for the crash and Daniel is afraid Molly was the intended target. Molly escapes with mostly minor injuries and during her recuperation, she investigates the killings. Molly is a former private detective who finds it difficult to leave her sleuthing days behind. During a time when women are expected to be nothing more than wives and mothers, she runs into some interference from her well-meaning mother-in-law who makes no effort to hide her disapproval of Molly's interest in the case. While Daniel appreciates the information Molly uncovers, she has to keep her activities hidden from Daniel's superiors. Unable to find a link between the previous murders, Daniel has little to go on so Molly begins her investigation by re-interviewing the victims' family members. She uncovers a few puzzling clues but she still cannot find a common denominator in the cases. Molly is also assisting her rather unconventional friends Elena "Sid" Goldfarb and Augusta "Gus" Walcott as they try to help a young girl whose family recently perished in tragic house fire. The pair have recently returned from Vienna where they studied with Freud and they hope their (somewhat limited) knowledge about dream interpretation can help unlock the truth about what caused the fire that took the girl's parents' lives. Eventually, these two investigations converge but will Molly discover the killer's identity before it is too late? Rhys Bowen’s latest book in her Molly Murphy mystery series, The Edge of Dreams, has a serial murderer on the loose in New York City. The murderer is taunting the police with letters directed to Molly’s police captain husband, Daniel Sullivan. Much to Daniel’s chagrin Molly is brimming with ideas and champing at the bit to get involved. She can’t help herself. Although some years ago she arrived a fresh-off-the boat immigrant, Molly soon found herself apprentice to a private investigator. When he Rhys Bowen’s latest book in her Molly Murphy mystery series, The Edge of Dreams, has a serial murderer on the loose in New York City. The murderer is taunting the police with letters directed to Molly’s police captain husband, Daniel Sullivan. Much to Daniel’s chagrin Molly is brimming with ideas and champing at the bit to get involved. She can’t help herself. Although some years ago she arrived a fresh-off-the boat immigrant, Molly soon found herself apprentice to a private investigator. When he was murdered, Molly successfully ran the business herself. It’s now 1905 and Daniel had hoped marriage and motherhood would keep her safely home as a good wife. He balks at what he considers her meddling, forbids her to get involved and refuses to discuss any part of the case with her, at least at first. But Molly is too bright and persistent and has more ideas than he or any of his peers to be still for long. She slowly involves herself in the investigation exposing herself to dangers she's only seen on the edge of dreams. I discovered this series in 2008 when there were seven books in the series. I started with Murphy’s Law when Molly, wanted for questioning for murder, flees the authorities in Ireland. She lands at Ellis Island where a fellow-traveller is murdered. Everyone is detained on the island as suspects, and intrepid Molly, determined to get on with her life in America, is determined to solve it herself. I read the whole series in a month and have eagerly awaited every new adventure. The characters are well developed and alternate lifestyles are explored with a light touch. Each story is well plotted and includes historical events that give an authenticity to New York City and the country of that era. I like that Bowen gives her own possible solutions to some of history’s unanswered questions of the time. Rhys is the most prolific writer on the literary scene today. She has three separate series: Her Royal Spyness with eight books; Her Molly Murphy series with fourteen, counting this one I am reviewing; and her Evan Evans series with nine. I have read a total of thirty-one Rhys Bowen's books. And I am thrilled to review her latest, The Edge of Dreams. Not only is she prolific, but she is the most natural storyteller writing today. The latest in the Molly Murphy series finds Molly's husband, a cap Rhys is the most prolific writer on the literary scene today. She has three separate series: Her Royal Spyness with eight books; Her Molly Murphy series with fourteen, counting this one I am reviewing; and her Evan Evans series with nine. I have read a total of thirty-one Rhys Bowen's books. And I am thrilled to review her latest, The Edge of Dreams. Not only is she prolific, but she is the most natural storyteller writing today. The latest in the Molly Murphy series finds Molly's husband, a captain in the New York City police force, stumped in a murder investigation. The murdered people have nothing in common, except the fact that Daniel receives taunting notes that are delivered to him following each time a person is killed. When Molly and her young son Liam are in a terrible train crash, a note to Daniel suggests that his wife is the target. Daniel's mother is staying with the family after they had moved into their rebuilt house after the first had been destroyed by a bomb. Molly had once owned her own detection agency, and her instincts are screaming to investigate. She had bruised ribs from the train wreck and has to limit her activities. Her old friends, Gus and Sid, offer to assist in a murder of two parents possibly killed by their only child. Now, the girl is having nightmares and dreams of a giant snake with slits for eyes. Gus and Sid had recently returned from working with Freud and offer to help the girl with dream analysis. This book was painful for me. I'm actually blown away that this is the 14th book in the series. Perhaps the author has ran out of ideas and the writing has gotten progressively worse. That is all I can come up with. Molly is obnoxious, arrogant, and plain rude. She talked about how every clue found was "all thanks to her" so many times, I almost put the book down and walked away. The way she continually rubbed her husband's failure in his face drove me insane. To be fair, her husband was also a complete jerk. I wouldn't put up with someone treating my friends that way. I feel Rhys Bowen is still figuring out a Molly who is as a wife and mother, and half of the book is her struggling to fulfilling those roles properly. I wish Molly wasn't just trying to charge into her husband's career and could keep her sleuthing separate. I was enjoying the two mysteries, but in the end they tied together. The mystery did pull me in, but I did figure out the answer before Molly even suspected it through some generic foreshadowing. I hope Molly's chemistry with others in the se I feel Rhys Bowen is still figuring out a Molly who is as a wife and mother, and half of the book is her struggling to fulfilling those roles properly. I wish Molly wasn't just trying to charge into her husband's career and could keep her sleuthing separate. I was enjoying the two mysteries, but in the end they tied together. Back from France Molly starts to made a home for them. Daniel is busy with MURDERS are occurring all over town covering all levels of society that have correlation with each other except Daniel receives a note before and after them. Molly and Liam are on an train that crashed killing a number of people. Molly is hurt and Daniel's Mother arrives to help. Molly and Daniel suspect that Molly was the target in the case. Is this true? Daniel begins to tell Molly about the case. These events come toget Back from France Molly starts to made a home for them. Daniel is busy with MURDERS are occurring all over town covering all levels of society that have correlation with each other except Daniel receives a note before and after them. Molly and Liam are on an train that crashed killing a number of people. Molly is hurt and Daniel's Mother arrives to help. Molly and Daniel suspect that Molly was the target in the case. Is this true? Another fun Molly Murphy Mystery, she, again gets involved in one of her husband's cases. Another fun Molly Murphy read. Like to see she is still feisty and that Daniel is becoming more and more excepting of her need to help him with his investigations. 2.5 stars. Would have been 3 if it hadn't dragged on. I saw the culprit as soon as he arrived on the scene. September 1905. Another fascinating Molly Murphy mystery. Back from France, Molly gets a surprise - her husband had the blown up house in Patchen Place rebuilt and Molly, Liam & Daniel can move back in. In her haste to move things back from Daniel’s small apartment where they had. Even staying, she and Liam are involved in the historic Ninth Avenue elevated train derailment that actually happened back on Sept 11, 1905. Molly survives as does Liam and then the story unwinds. This was a wonderf September 1905. Another fascinating Molly Murphy mystery. Back from France, Molly gets a surprise - her husband had the blown up house in Patchen Place rebuilt and Molly, Liam & Daniel can move back in. In her haste to move things back from Daniel’s small apartment where they had. Even staying, she and Liam are involved in the historic Ninth Avenue elevated train derailment that actually happened back on Sept 11, 1905. Molly survives as does Liam and then the story unwinds. This was a wonderful read, and like the el train, full of twists and turns and interwoven to seemingly unrelated murders of a series of people over four months. The subplots are also intriguing dealing with the growing “alienist” doctors of the young science, psychology, and Sid & Gus’s (Molly’s delightful loyal neighbors) support of the women’s suffrage movement, Vasser alumni, and Freud’s dream theory work. And Molly’s continued struggle with her own natural curiosity and sense of justice, her Irish 6th sense, and her role as a wife and mother and her love of detective work, make this a non-stop read for this reader. I appreciate the author’s work at Molly’s character development as she matured and deals with her husband’s patriarchal behavior due to cultural Times and his job and her struggle as a non-conformist with her mother-in-Law and other women during this era. In my opinion, a fine addition to this series. With Daniel engrossed in trying to find a serial murderer on the streets, Molly is desperate to help. But, when danger strikes home and Molly and Liam are nearly killed in an accident, she finds herself with a concussion, bruised ribs and begrudgingly in the care of her mother-in-law. Daniel and Molly find themselves concerned that Molly might be the target. Sid and Gus have recently returned to New York excited about the study of dreams. During a suffragist meeting, one of the women privately a With Daniel engrossed in trying to find a serial murderer on the streets, Molly is desperate to help. But, when danger strikes home and Molly and Liam are nearly killed in an accident, she finds herself with a concussion, bruised ribs and begrudgingly in the care of her mother-in-law. Daniel and Molly find themselves concerned that Molly might be the target. Sid and Gus have recently returned to New York excited about the study of dreams. During a suffragist meeting, one of the women privately asks if they might be able to visit her niece, who is tortured by nightmares following the death of her parents. After hearing the tale, Molly begins to wonder if Daniel's murders are somehow linked to the death of this girls' parents. Can she figure out the details before Mabel is sent to the tombs by an overzealous lieutenant? It's funny reading others reviews. Some hate Daniel, think he's chauvinistic. Some think he's gotten dumb and soft. Some can't stand Molly's mean spirit. Some wish she wasn't married. Some love everything and think that this was one of Bowen's best. Others say that she really let them down on this one. I thought that this story was on a par with others. Molly does dive into situations without good judgment, but she always has. She is not as likable a character as Rhys Bowen's other heroine, Geo It's funny reading others reviews. Some hate Daniel, think he's chauvinistic. Some think he's gotten dumb and soft. Some can't stand Molly's mean spirit. Some wish she wasn't married. Some love everything and think that this was one of Bowen's best. Others say that she really let them down on this one. I thought that this story was on a par with others. Molly does dive into situations without good judgment, but she always has. She is not as likable a character as Rhys Bowen's other heroine, Georgie. Daniel worries about her but admits that she is a good detective. A solid installment to the Murphy series. They case was interesting and Daniel is finally getting around appreciating his wife. My problem, however, is that the whole idea of things just working out for Molly every time is getting trite. She makes wild assumptions, undermines investigations, and makes poor decisions all the time, yet she's always right and always ends up fine. Just once, it might be nice to see her have actual consequences for overstepping bounds. I love to read a Mollie book by Rhys Bowen. This one is definitely one of my favorites. The history is revealing to a history buff, the plot is twisty and everything a mystery buff could desire. The story itself adds to the life of a great mystery character. This book, in particular with it's wide variety of victims, leads the reader to question her own thoughts about who the killers, or possibly only one killer, really is. Over and over! Whoa--I really liked this one. Daniel and Molly have really come to understand one another, such that Daniel is more accepting of her help and Molly is less reckless and more responsible in her sleuthing. It was wonderful to see the two of them combat the mystery together. And what a mystery! There's gruesome serial killings and no common links and a train wreck and all kinds of chaos. I absolutely loved reading this one through and through and can't wait to pick up the next installment. Another page turner as we wonder if Molly has a chance this time. Her witness - a young child - can't remember a thing. And, everyone is dying around her. And, what are her dreams warning her of? I love the Freud perspective and how Rhys Bown brings weaves history into mystery! If in the first book Molly seemed older and wiser than her 22 years, in this book she seemed younger and sillier than her 27 years. Also, I might have enjoyed the book more if I weren't a mother to a young son. It is hard for me to imagine risking the life and safety of myself for my own gains, or, for that matter, risking my life and safety when I am responsible for a child. This review has been hidden because it contains spoilers. To view it, click here. Entertaining enough to keep me reading but not compelling. Probably won't read another. I do like the Evans books by this author. Too bad. Met Rhys Bowen at a literary salon and have a signed copy of this book.